Anyone who has ever witnessed a performance by Sue Tompkins will be familiar with her dynamic delivery of fragmented texts, be it solo in gallery spaces or as vocalist with seminal turn of the century Glasgow-based quartet, Life Without Buildings. Luke Fowler's films have adopted a similar cut and paste approach to transforming more straightforward documentary footage into something more poetic. This second collaboration between the pair sees Fowler filming Tompkins in the recording studio as she lays down a version of Country Grammar, one of her earliest performance pieces, which dates from 2003. Rather than adopt a make-believe vérité approach, Fowler disrupts the process in various ways, from having sound and vision exist independently from each other to making the camera appear to be jumping up and down. This echoes the playful physicality of Tompkins' performance, which here uses two different microphones, so her torrent of words come at you from all sides. Tompkins' sing-song incantations continue to be heard as Fowler takes his camera for a walk outside. Fowler's collage-like approach superficially resembles One Plus One, Jean Luc Godard's 1968 film, which jumped between the Rolling Stones recording Sympathy For the Devil, and various staged revolutionary and counter-revolutionary activities. Here, however, Fowler takes a more everyday approach that's just as instinctive as Tompkins' own. Image and audio work in counterpoint, as if thoughts were rubbing up against each other, flying blind into the next thing in tandem. Tompkins' words and Fowler's camera are unable to keep up, deliriously out of synch with their own thought processes that they're chasing throughout the film's eighteen minute rush. With four small paintings by Tompkins on the gallery wall possessed with similarly urgent splurges, the result is an ever-expanding mutual tapestry of words and worlds in motion. The Modern Institute Airds Lane, Glasgow until Sat 4 Nov. 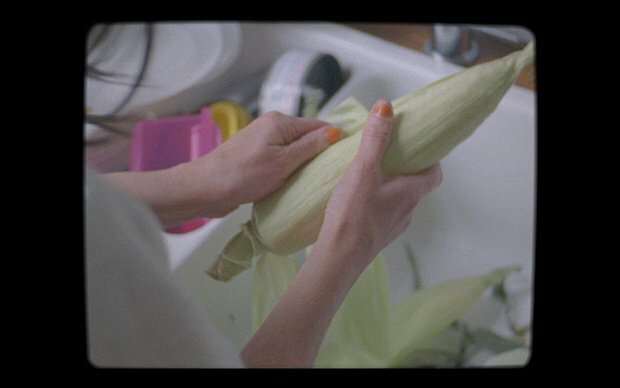 In Sue Tompkins and Luke Fowler's second collaboration, the latter's film focuses on the former's performance Country Grammar created in 2003, one of her earliest pieces performed within a gallery context.